My Bariatric Life "Tells All" About Her Tummy Tuck! Ch.14 Is this Swell Hell? Absolutely everything you want to know about abdominoplasty Read Chapter 1 hapter 1ummy Tuck Day 10 Post-Op, Is this Swell Hell? As stated earlier in this article, I had been communicating with my surgeon about my swelling since April 26th, just 8-days post op. On that day the swelling had gotten worse. I could not button my pants. I could not even bring the two ends of the pants together to close them! How could it be that I had just had 6 pounds of redundant fat and skin removed with a tummy tuck but I could not fit into my pre-surgery pants? You can read this very interesting discussion by clicking here. I had no idea that there would be this level of swelling so when it happened it shook me up. 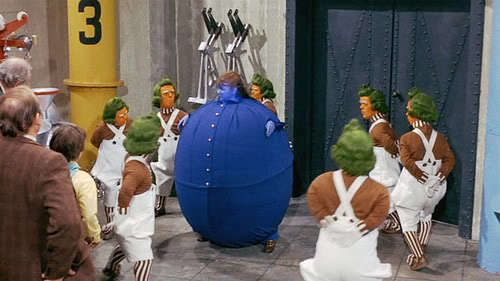 Do you recall the scene from Willy Wonka and the Chocolate Factory when Violet ate the gum that made her turn blue and swell? Her belt popped off because her waist swelled so much. Well, that was how I felt at the time, except it was not my belt that popped open! The plastic surgeon's comment was confusing to me. If not a collection of fluid and blood, what was it? I contacted my surgeon, again.